Earlier this month, Google added a captcha to their crawl and submit to index feature in the Google Search Console's Fetch as Google tool. Now, Google has set a quota to how many times you can use the "multiple URLs" submission method in that tool to 10 per month. Google's John Mueller said on Twitter that this quota is only "temporary" and was due to abuse. 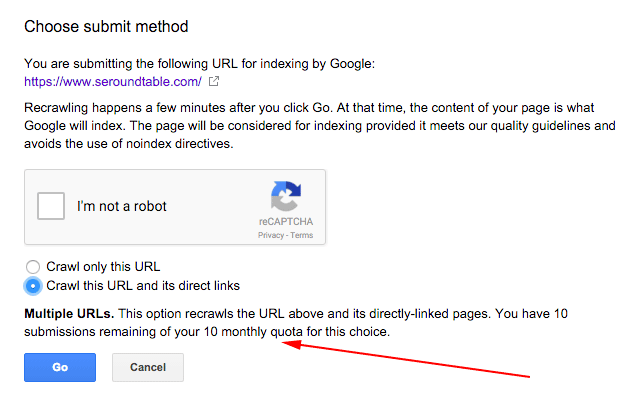 It is unclear for how long Google will have to keep this quote, the single URL method has a 500 per month quota, as opposed to a 10 per month quota. @iqseo There's been a lot of abuse, so we've had to take some temporary measures to protect our site. You give us nice tools and then someone abuses it and Google has to take it away. Update: It seems this quota is not new, so I am not sure why John replied like that?